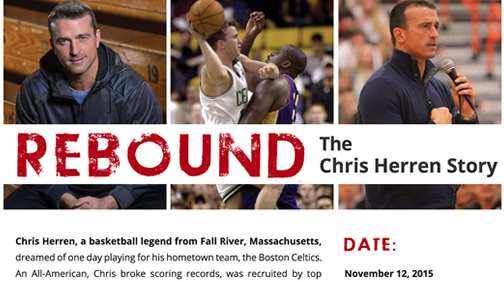 Please join us for an inspiring presentation featuring former NBA professional basketball player, Chris Herren. His tale of a harrowing decent into addiction, a miraculous recovery and his new life mission: to share his story with audiences in the hopes of reaching just one person and making a difference in their life. Chris Herren, a basketball legend from Fall River, Massachusetts, dreamed of one day playing for his hometown team, the Boston Celtics. An All-American Chris broke scoring records, was recruited by top colleges, featured in Sports Illustrated and became the focus of an acclaimed book, Fall River Dreams. Herron realized his lifelong dream of playing in the NBA when he was drafted by the Denver Nuggets in 1999 and was traded to the Boston Celtics after his rookie season, but lost it all due to substance abuse. Alcohol and drug-free since August 1, 2008, he has refocused his life to put his sobriety and family above all else. He shares his harrowing story of abuse and recovery in his memoir, Basketball Junkie, as well as in numerous interviews throughout the Emmy nominated ESPN Films documentary Unguarded, of which he is the subject. Tickets can be purchased at www.chucktownsquash.org.